NEWPORT BEACH, CA and SEATTLE, WA--(Marketwired - September 30, 2014) - (Shop.org Summit, booth # 1917) - CAKE, the digital marketing software division of Accelerize (OTCQB: ACLZ) (OTCBB: ACLZ), today introduced CAKE for Advertisers, a new software as a service (SaaS)-based solution that unifies the tracking, attribution and optimization of digital marketing costs across search, display, email, video, social, affiliate and other channels. Designed to unlock the value of real-time insights for digital marketers, the CAKE multi-channel marketing intelligence hub supports the full breadth of channel analysis needs with advanced data visualization capabilities and pre-built, third-party technology integrations. 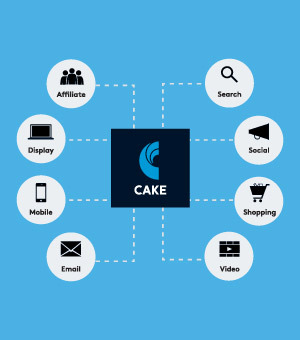 Additionally, CAKE for Advertisers' foundation is based on the powerful tracking technology from CAKE's industry-leading performance marketing platform. CAKE will be debuting the new product at Shop.org Summit 2014 (booth #1917) held Sept. 29 - Oct. 1 at the Washington State Convention Center in Seattle. "Marketers as well as advertising agencies and performance-based networks are faced with the challenge of implementing and valuating digital campaigns with fragmented tools and ambiguous data," said Santi Pierini, CAKE President and Chief Operating Officer of Accelerize. "With CAKE for Advertisers we're extending our best-of-breed tracking knowledge beyond pay-for-performance marketing, to transform the way digital marketers attribute and optimize digital spend across multiple marketing channels." Multi-channel Tracking and Reporting Analytics - Tracks the customer journey across multiple touchpoints and channels including search, display, email, social, mobile, video, affiliate, direct and shopping. Marketers can then redirect spend in real-time through data-driven insight into the channels that drive traffic, customize reporting by user and share these views across an organization. Multi-touch Attribution - Supports attribution models including engagement, linear, time decay, custom as well as first/last touch. By providing deeper insight into how specific tactics impact the performance of digital spend across the customer journey, advertisers are enabled to measure the most effective touchpoints across channel and source investments. Advanced Data Visualization - Illustrates third-party data points and metrics regarding marketing performance, all on one platform, through visually rich reporting elements such as Sankey and Sunburst diagrams. Digital Spend Optimization - Gives advertisers the ability to easily identify high- and low-performing channels and sources through data comparison and visualization across various marketing channels and traffic sources on a single dashboard. This helps clarify in real-time which digital campaigns are driving ROI and uncover optimization opportunities. It also allows users to make intelligent marketing decisions based on custom rules that have shown to maximize ROI. Integrations/Open API - Leverages pre-built, third-party integrations, coupled with an open API. This allows users to seamlessly integrate data from their existing technology solutions that could include leading ad servers, social media platforms, email management tools, bid management solutions and more. For example, marketers can easily view performance within channels and drill down to its specific traffic sources including Google, Bing, YouTube and Twitter. New integrations will be introduced monthly. "Global ad revenue expenditures are projected to increase 5.3% reaching $532 billion by the year's end," wrote Andrew Frank, Vice President Distinguished Analyst and Michael McGuire, Research Vice President of Gartner. "Global ad revenue continues to grow in 2014, fueling investments in data-driven advertising technologies and techniques designed to improve targeting, attribution and measurability, as well as to accommodate new formats and channels." Accelerize New Media, Inc. (OTCQB: ACLZ) (OTCBB: ACLZ) offers marketing technology solutions that revolutionize the way advertisers leverage their digital advertising data. For more information, visit www.accelerizenewmedia.com. This press release may contain forward-looking statements from Accelerize New Media, Inc. within the meaning of the "safe harbor" provisions of the Private Securities Litigation Reform Act of 1995 and federal securities laws. For example, when we describe the growth in global ad revenue expenditures and in global ad revenue, fueling investments in data-driven advertising technologies, we are using forward-looking statements. These forward-looking statements are based on the current expectations of the management of Accelerize New Media only, and are subject to a number of factors and uncertainties that could cause actual results to differ materially from those described in the forward-looking statements. The following factors, among others, could cause actual results to differ materially from those described in the forward-looking statements: changes in technology and market requirements; our technology may not be validated as we progress further; we may be unable to retain or attract key employees whose knowledge is essential to the development of our products and services; unforeseen market and technological difficulties may develop with our products and services; inability to timely develop and introduce new technologies, products and applications; loss of market share and pressure on pricing resulting from competition, which could cause the actual results or performance of Accelerize New Media to differ materially from those contemplated in such forward-looking statements. Except as otherwise required by law, Accelerize New Media undertakes no obligation to publicly release any revisions to these forward-looking statements to reflect events or circumstances after the date hereof or to reflect the occurrence of unanticipated events. For a more detailed description of the risk and uncertainties affecting Accelerize New Media, reference is made to Accelerize New Media's reports filed from time to time with the Securities and Exchange Commission.